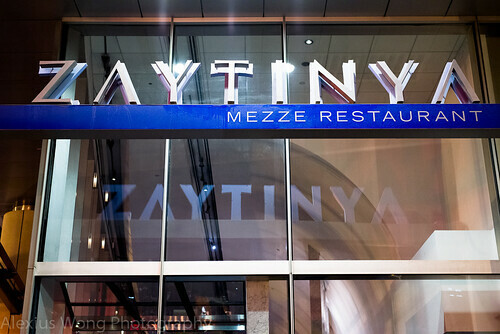 A call from a long-time friend for dinner was immediately returned with an affirmative answer, especially when it was an invitation to Zaytinya in Washington DC. I had known about this buzz-filled establishment recommended by many foodies and friends. However, I dared not make a visit to its location in the very busy and restaurant-filled 9th street corridor due to the logistical obstacles set-up by the DMV, that is the DC Motor Vehicles – speed cameras, limited street parking, expensive garage parking, and metered street parking until midnight, if you can find one. 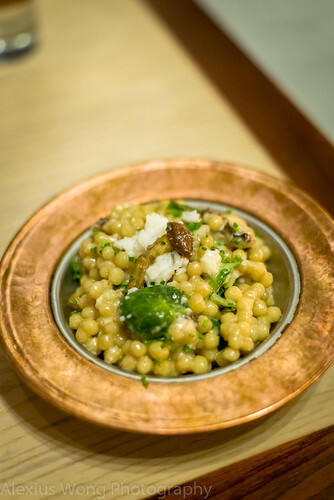 Well, I could not forgo this opportunity of visiting this Mezze-style eatery, owned by José Andrés, who owns the veteran tapas Spanish restaurant, Jaleo. After finding free parking a few blocks, I knew I was in for a good experience. 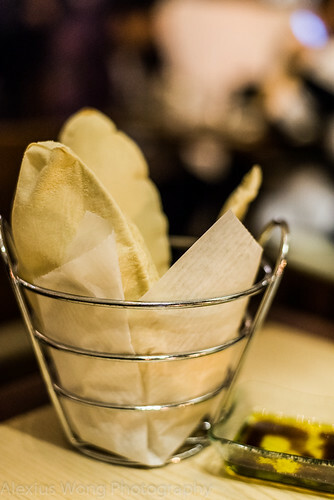 Zaytinya’s menu is filled with small sharing dishes from the lower Mediterranean, notably Turkey, Greece, and Lebanon. Perusing the menu can be quite daunting with the dishes labeled in the original names. But reading the descriptions gives the diner a general idea of what to expect and a picture of the flavors and dish itself, perhaps jolting a memory of the dish from the recesses of the mind. I recognized a few that I have eaten over the years and was adventurous enough to try a few new ones, mulling over them as I munched on the complementary pita bread which was light and well-baked, but lacking a sense of character, like yeast and wheat bran notes that I would expect from a good Mediterranean bakery. But I was quick to overlook it since I was anticipating the dishes that would make up our dinner. The first to arrive was Fattoush. It is a Lebanese salad that usually consists of lettuce, cucumber, red onions, green peppers and topped with baked pita croutons. 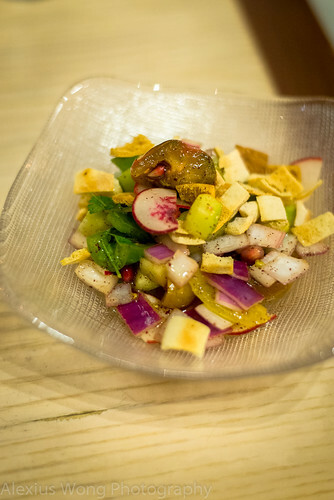 The version here had in addition pretty slices of red radish and mouth-popping pomegranate that added its sweet and fruity notes along with some toothsome texture. The pomegranate vinegar dressing was a departure from the usual lemon and olive oil dressing; however, the use of the sour Sumac powder didn’t venture far from the traditional. This salad was a fresh meal opener with the very fresh ingredients and the various flavors and textures waking the mouth up with these appealing elements. The next to be served was Batinjan Bil Laban. 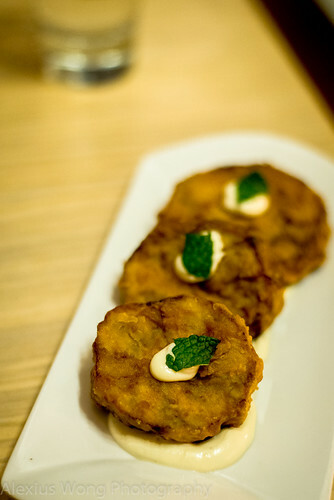 Three rings of deep-fried battered eggplant arrived sitting on a pool of roasted garlic yogurt sauce and a piece of mint leaf. One bite into them revealed a skillful kitchen with the perfectly fried and nearly grease-free pieces. The batter was light and crispy at the same time, revealing an ethereally light and melting eggplant inside sans any bitterness. The yogurt sauce was the necessary companion that added some creaminess, acidity, mild garlic notes, and a depth in flavor. I could not get enough of these crispy/melting bites with their perfect pairing of textures and flavors. To round off the meal, we chose a couple of non-vegetable dishes. One order was Fried Squid. Pieces of the seafood arrived with some garlic-yogurt sauce on the side. I was expecting the usual from these morsels, perhaps due to me having my fair share of this. 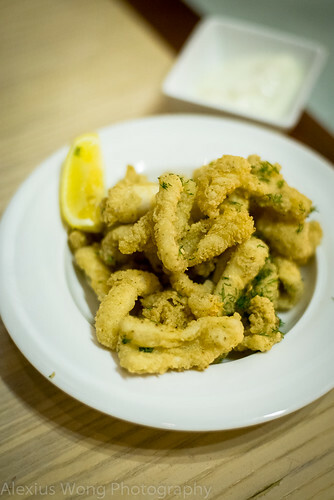 Each piece was not only perfectly battered and fried, but the squid was tender and fresh tasting. The fresh dill on top provided the fresh herbaceous note to the seafood that added more interest, as well as the pungent garlic-yogurt sauce that lent more flavor and creaminess to each bite. My eye was zoning in on the last few scrumptious pieces, to which I made my move before my dining companion could – checkmate. 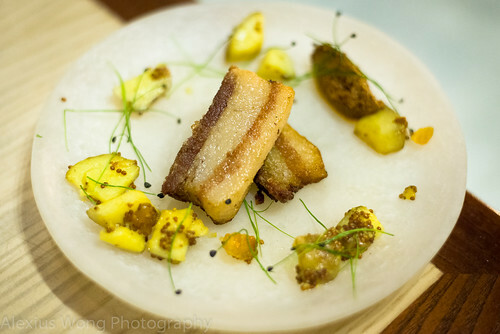 The other savory dish was a special – Seared Ossabaw Pork Belly. The beautiful alabaster plate arrived with two pieces of pork belly, potato confit, grain mustard sauce, and orange gliko. One bite into the belly pointed towards a quality ingredient that has been prepared well, with the mild tasting pork fat and meat exuding a its rich porcine flavor. Equally strong were the pieces of potato, perhaps Yukon Gold, that were full of flavor and character, and they were competing for this diner’s attention. The mustard sauce was the right match for the fatty meat, as well as the orange gliko, a type of Greek marmalade, that was peaking my gastronomic curiosity with its faint bitter orange and sweet notes that also matched the fatty pieces well. But this was a rich dish which I enjoyed more than my friend, who took only a small bite. Just as we thought we were done with the meal, we decided to look at the dessert menu, and we ended up ordering the Turkish Coffee Chocolate Cake. 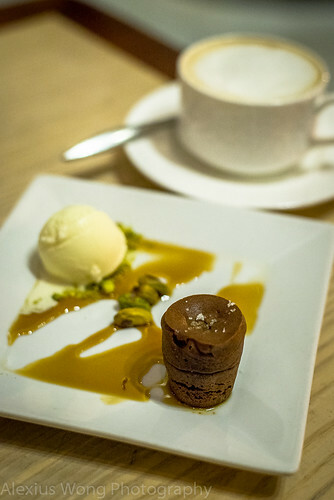 The plate arrived with a molten chocolate cake (fondant) with some sea salt grains on top, dressed with some caramel, pistachio nuts, and ice cream. One break into the cake revealed its hot gooey interior, tasting of the slight bitter notes from the rich coffee and dark chocolate, and complemented by the salty element. The caramel sauce was called for to add the sweet balance to each bite. But it was the ice cream that got my attention most. There was a unique flavor that I had never come across, and my mind was racing through mental archives to find its origin. After making a query to the waiter, I was told that it was pistachio sap used in the ice cream, which was quickly filed in my mental notes. What a interesting ingredient that reminded me of maple syrup, and I was tempted to lick every melted drop from the plate. My friend’s cup of cappuccino was more than adequate with its bold flavor without the bitterness usually found in American blend. Well, that was a visit well over due. What I appreciated about this establishment besides its swanky space is the variety of flavors found in this Mediterranean-inspired menu which not only showcased quality in the cooking but also the ingredients themselves. Yes, you sense the respect for the traditional dishes, but a bit of creativity has been infused into the usual to give them some new interests. Furthermore, I was titillated by the new flavors found in the use of certain ingredients, as in orange gliko with the pork belly, and mastiha in the ice cream. 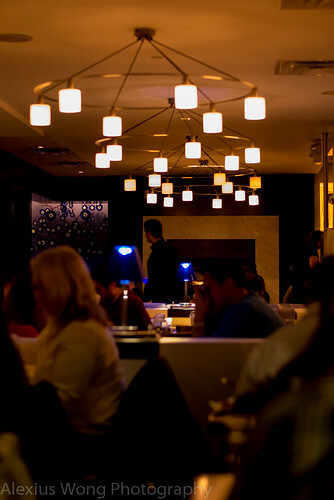 Even with only 5 savory small plates and dessert between two, my friend and I were more than satisfied with our orders. To top it off, the bill only came up to $55 for the both of us, which, in my estimation, is very reasonable for this calibre of cooking and for the DC restaurant scene. Now, that is Good Eats!